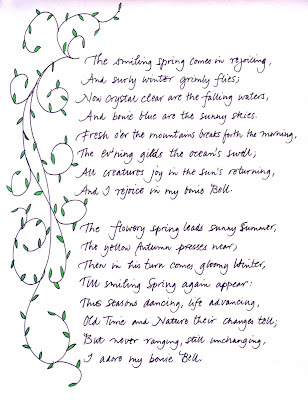 January 25 is the birthday of the Scottish poet Robert Burns. To celebrate the day, I wrote out one of his poems. Although I now do most of my writing on the computer, it is still satisfying to put pen (or marker) to paper. I love your blog. I've been reading it for about 2 months now and I always get inspired by your work. I keep up through facebook, so thanks for making it easy and accessible!